« Who is Chris Campbell? London Dynamo’s social secretary Nigel Smith recently asked me to write an account of the club’s brief history for a short book he’s putting together as part of our forthcoming tenth anniversary celebrations. I declined because I would struggle to accurately chronicle all the events that have taken place since I stopped writing the newsletter five years ago. But I told him I’d provide a link to issues 100 and 200 of DYNAMITE!, which together comprise a reasonably humorous synopsis of Dynamo’s first half-decade and could be reproduced in his members-only tome. Nigel also wanted to have a look at some old Dynamo-related photos in my possession which he could consider for inclusion. So instead of emailing all that stuff over to him, I thought I’d stick it on here instead. Behold the contents of my virtual musty shoebox! A world exclusive for The DYNAMITE! Files: this is the only photograph on the interweb (try a Google image search if you don’t believe me) where you can see the face our elusive leader Paul Harknett. 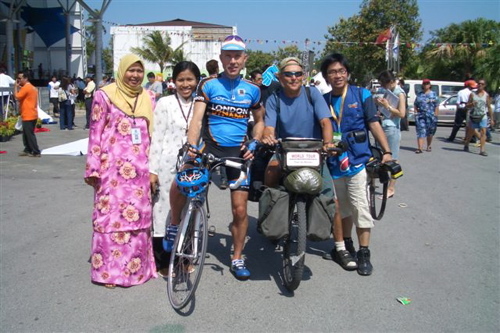 The image captures Lord Harknett’s brief moment of fame at the Tour of Langkawi’s opening stage in 2007, where many confused Malaysians lingering around the finish thought he was a professional cyclist (bald head, compact physique, blue jersey, getting on a bit – yeah, it’s probably Levi Leipheimer). As the real pros disappeared into their team buses, Paul was only too happy to pose for a number of photos and conduct an interview for a Japanese TV station. What a gent! 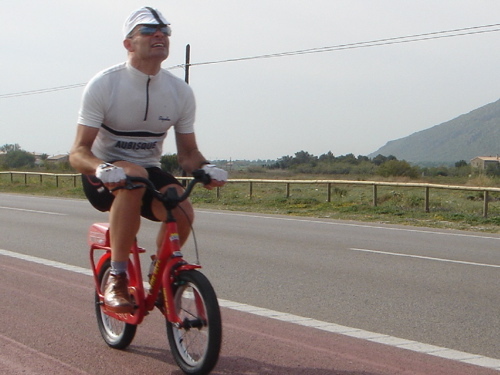 In 2005, when his Covent Garden bike boutique was the club’s main sponsor, Cyclefit guru Phil Cavell ventured up a few French mountains armed only with a bicycle, a sense of self-belief and a substandard level of fitness. I don’t know which mountain he was on when this photo was taken, and judging by his face, neither does he. 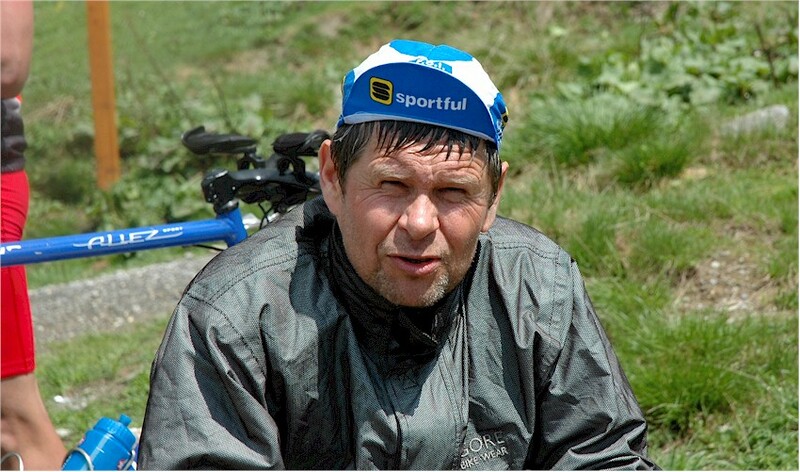 Cycling is truly a cruel mistress, and a love of her charms can make a happy man very old. 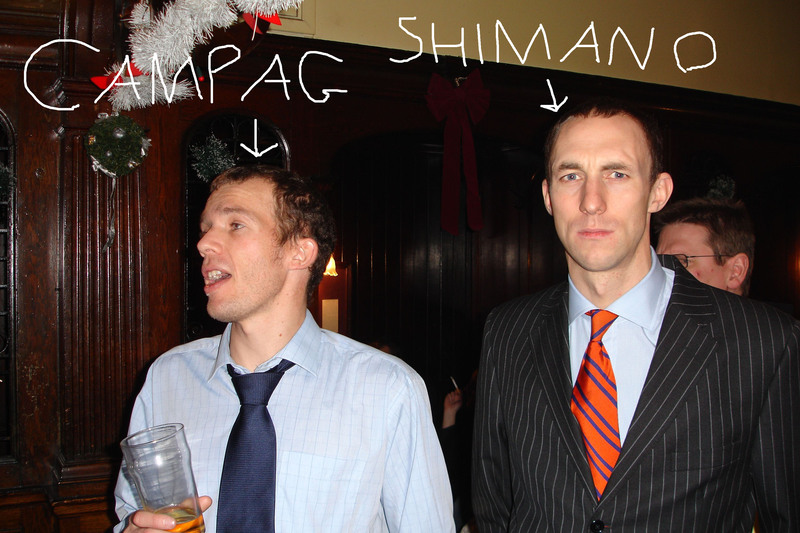 Taken at the Christmas social pre-dinner drinks in 2005, this classic image remains the most succinct expression of the two chums’ contrasting characters. Guysie on the right, so focussed yet slightly confused. Stu, probably slightly confused and certainly unfocused. Also, by scribbling two words on this image, I have introduced an exciting new angle on a well-worn “which is better?” debate. Poor Streuley. 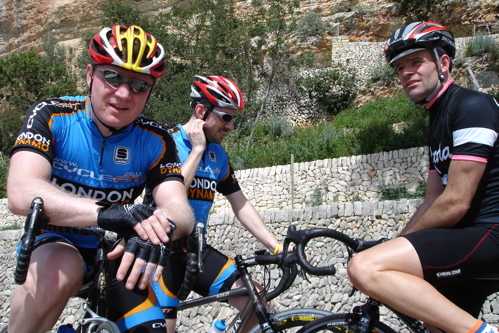 Arriving at Palma airport for the Dynamo training camp in April 2006, the former mountain biker discovered all his luggage and his bike had gone missing somewhere between Heathrow and Mallorca. But did he let that get him down? 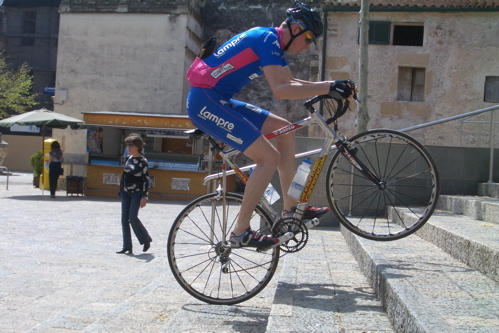 Of course not – and here’s the proof, as the baby-faced wonderman delights in showing off his superior bike-handling skills during a rest day coffee stop. To a casual onlooker, it may seem like Rouleur’s head honcho, seasoned time trialist and Dynamo co-founder Guy Andrews wasn’t taking this prestigious event entirely seriously. A frankly terrible photo from a compositional perspective, and I apologise to Stu for cutting off half his face. 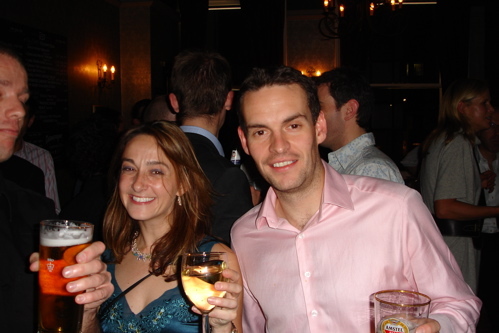 Although, come to think of it, he could have been photobombing – in which case, Stu, you bloody idiot, you’ve spoilt a perfectly good snap of the 2006 Christmas social. Anyway, Stupot isn’t the most important element of this scene, and it was only a few months ago that the person in the background pointed this out to me. Look behind ‘Pinky’ Gardner’s left shoulder and you will see none other than Richard Simmonds – Jenny’s future husband, who she met later that evening. Awwww! 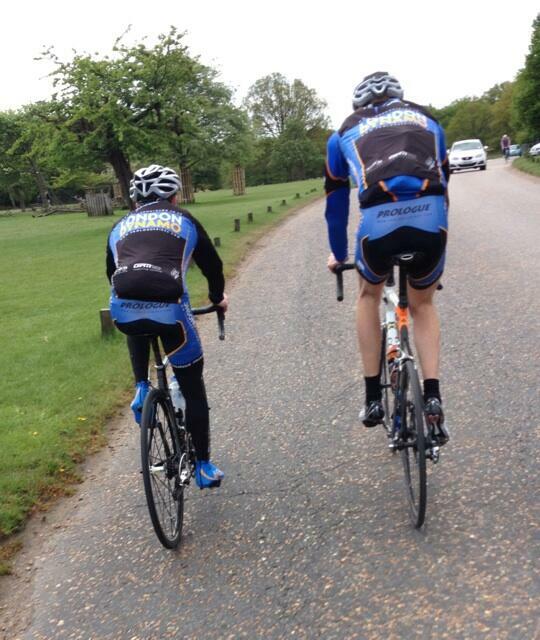 It’s always a unique joy to see Dynamo’s lankiest rider side-by-side with the appropriately-named Mr Short. Despite seeing this scene many times during the past decade, I only thought to take a photo a few weeks ago as we enjoyed a leisurely post-Parkride lap together. 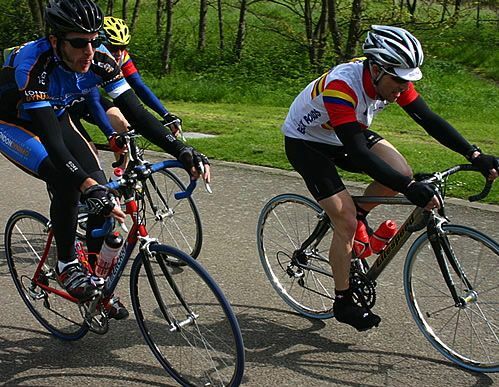 Seven years before Bradley Wiggins sported a pair of sideburns during his victorious Tour de France, a trailblazing Dynamo showed off a magnificent pair of chops at the legendary Lea Valley circuit. I wonder whatever became of him. This entry was posted on	July 26, 2013 at 3:08 am	and is filed under Uncategorized.